We have extended the test-area methodology, valid initially for calculating the interfacial tension in the NVT or canonical ensemble, to the grand canonical ensemble. In the figure (Fig. 2 of the manuscript published in Journal of Chemical Physics) we show the solid-fluid interfacial tension of LJ molecules adsorbed on slitlike pores of (a) different pore widths H* and dispersive energy ratio εsf/εff = 2.0 and (b) pore width H* = 8 and different dispersive energy ratios εsf/εff obtained from the TA method in the grand canonical ensemble (blue circles), from the TA method in the canonical ensemble (red squares), and from the Irving-Kirkwood procedure in the grand canonical ensemble (green triangles). The blue dashed line is a guide to the eye. 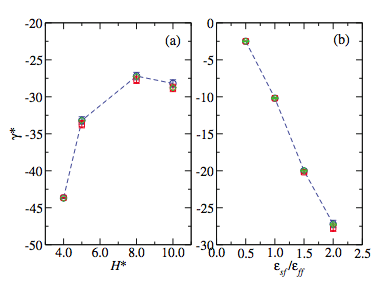 We have prosed a new methodology to account for the long-range corrections of dispersive forces in inhomogeneous systems. This method deals separately with the two interfaces that are usually present in a simulation setup. In the figure (Fig. 1 of the manuscript published in Journal of Chemical Physics) we show an illustration of the semi-infinite boundary conditions. Full lines indi- cate the actual density profile in the simulation box, with molecules in the fi- nite interval [-D/2,D/2] and a liquid slab about z = 0. Horizontal dashed lines indicate a continuous extrapolation of the bulk densities. Top figure shows semi-infinite boundary conditions for a molecule in the interval [-D/2,0] (left interface). A molecule less than Rc away from z = 0 feels explicit Lennard– Jones interactions within the cutoff sphere (including those of molecules with z > 0 contained in the shadowed red region), plus the effective slab poten- tial with all molecules in the interval [zv(i), zl(i)] and semi-infinite slabs of vapor and liquid density at zv(i) and zl(i), respectively. Bottom figure shows semi-infinite boundary conditions appropriate for molecules in the interval [0, D/2] (right interface). 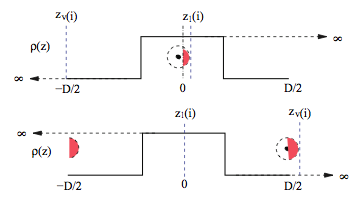 A molecule less than Rc away from z = D/2 feels explicit Lennard–Jones interactions within the cutoff sphere, thus interacting with molecules at z = −D/2 across the boundary conditions (as depicted in the shaded red region). The effective slab potential is felt with all molecules in the interval [zl(i), zv(i)], while semi-infinite slabs of liquid and vapor den- sity are felt at zl(i) and zv(i), respectively. We have applied the SAFT-VR DFT approach for mixtures, which is a formalism based on Density Functional Theory (DFT) and the Statistical Associating Fluid Theory (SAFT), to deal with real substances of relevance in industry. In the figure (Fig. 9 of the manuscript published in Fluid Phase Equilibria), we represent the isothermal pressure-composition Px projections of the fluid phase diagram at (a) 348.15 K and (b) 298.15 K, and (c) interfacial tension for the carbon dioxide + water binary mixture at 298.15 K (circles) and 318.15 K (squares). 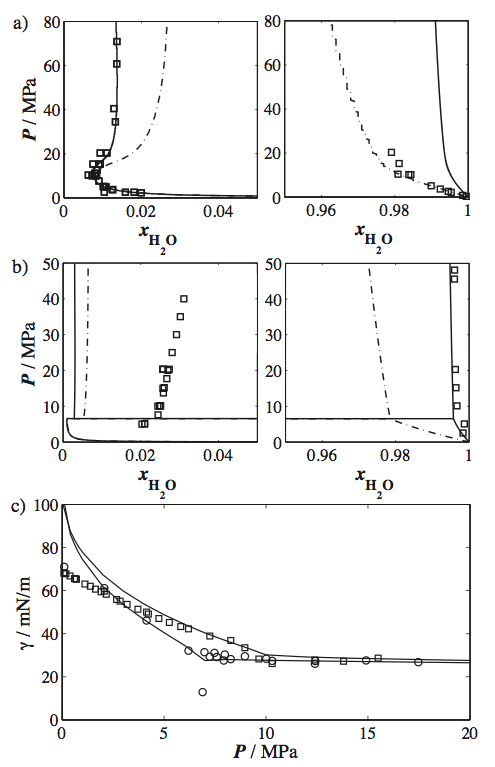 The continuous curves in (a) and (b) are the description with the SAFT-VR approach using a value of the binary interaction parameter of kij= 0.0150, estimated from the experimental fluid phase equilibrium data in the carbon dioxide-rich phase at 348.15 K; the dashed curves in (a) and (b) are the corresponding description with SAFT-VR using a kij=−0.0600, taken from Mac Dowell et al. . The curves in (c) are calculated using the full SAFT-VR DFT treatment with kij = 0.0150. The symbols are the experimental data for the fluid phase equilibria  and interfacial tension [120,121]. 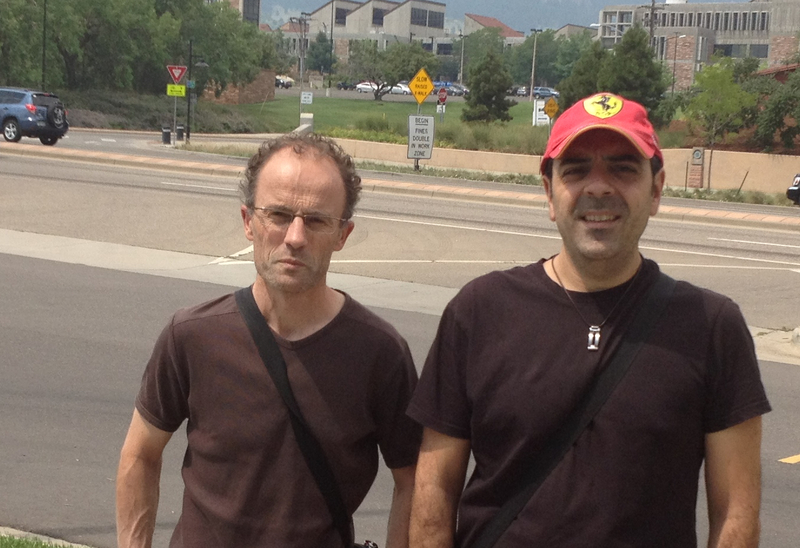 Dr. Bruno Mendioubre, Maître de Conference from the Université de Pau et Pays de l'Adour, is visting us a short visit of six months (since February to July, 2012). Dr. Mendiboure, member of the Laboratoire des Fluides Complexes et leurs Réservoirs of the Université de Pau, has been collaborating with our Group since late 2009. Dr. Mendiboure is expertise on the determination of the interfacial properties, with special emphasis on interfacial tension, of complex substances using Density Gradient Theory and Density Funcional Theory. In particular, the goal of our collaboration reserach will focus on the study of the interfacial properties of fluids adsorbed onto cylidrical porous materials. In addtion to that, Dr. Mendiboure and our Group will also collaborate on the extension, use, and application of new Monte Carlo techniques for dealing with this systems.